There have been a couple of windstorms around here lately. Yesterday we discovered a fairly good sized branch that had broken away from what I think is a hemlock hanging precariously over the playground, it's jagged end pointing directly downward, like, the kids said, "a spear." It was going to come all the way down at some point, probably the next windy day, so the adults decided we should see if we could make it come down on our schedule. 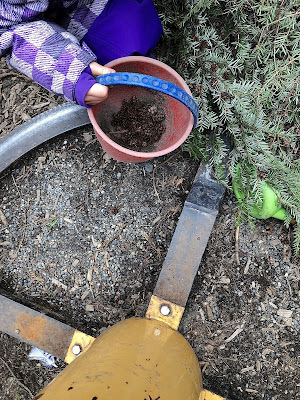 One of our fathers balanced atop the fence and used a long-handled shovel to wrangle it loose and down it came, not with a thud, but with a dramatic rustle of fir needles. The kids were instantly around it, in it, and on it. There was chatter about making it a "bird nest" or a "fort." 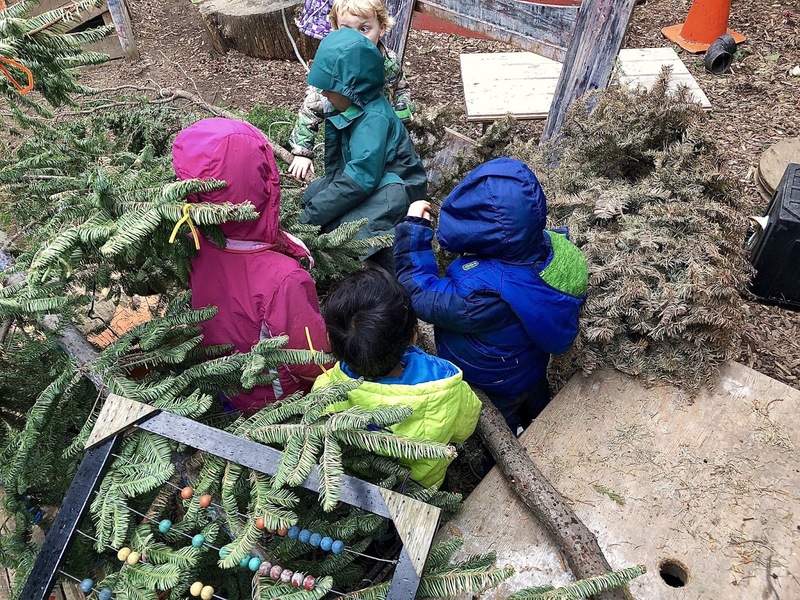 Then they discovered the thousands of tiny cones still attached to the ends of the many branches. Eventually, together, they came around to the idea of moving it and, after some discussion, decided on the bottom level of our sandpit, near our row boat. "We need more kids! 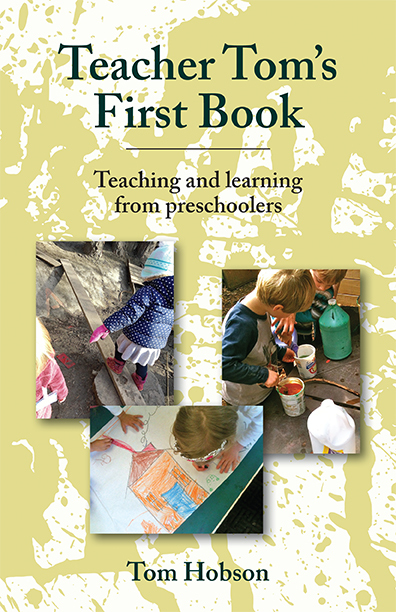 We need more kids" they shouted, turning it into a kind of a chant. The team assembled, but struggled to get everyone working together. Some pulled, while others pushed; some quit, while others were just getting started; some stood on it, while others got under it. In that way it was a bit like any new, leaderless community project, everyone involved bringing their ideas, expertise, and abilities to the table in a willy-nilly fashion. On Monday, I had cut off a dozen or so new lengths of rope. 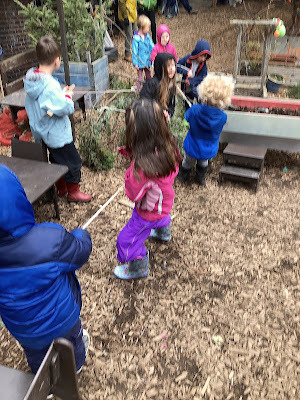 At some point, someone said, "We need to use ropes" and the kids scattered to round up what they could find. 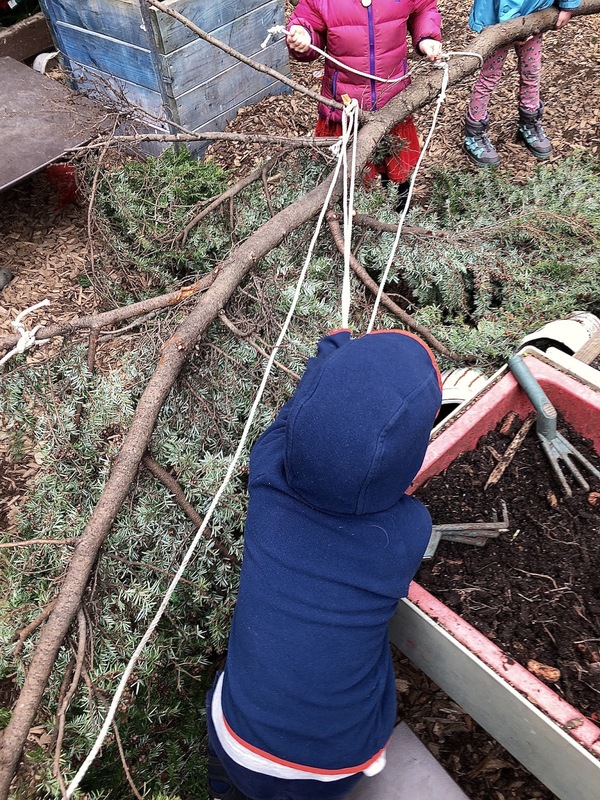 Some of them managed to tie their ropes to the branch on their own, while I offered my services for those who haven't yet mastered the skill. In all honesty, it wasn't the most practical of ideas. 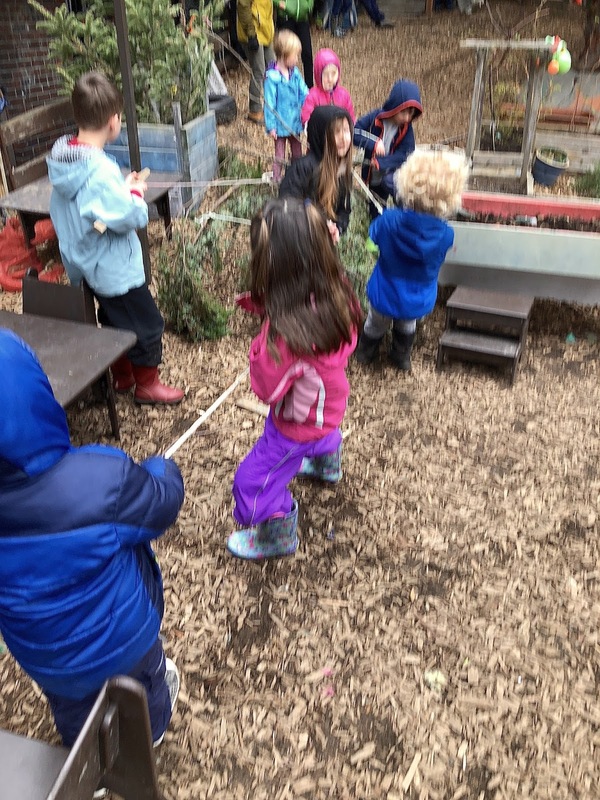 In my judgement, they would have had better luck attempting to lift and carrying it, but it was a unifying idea, with each child grabbing the end of a rope and pulling. 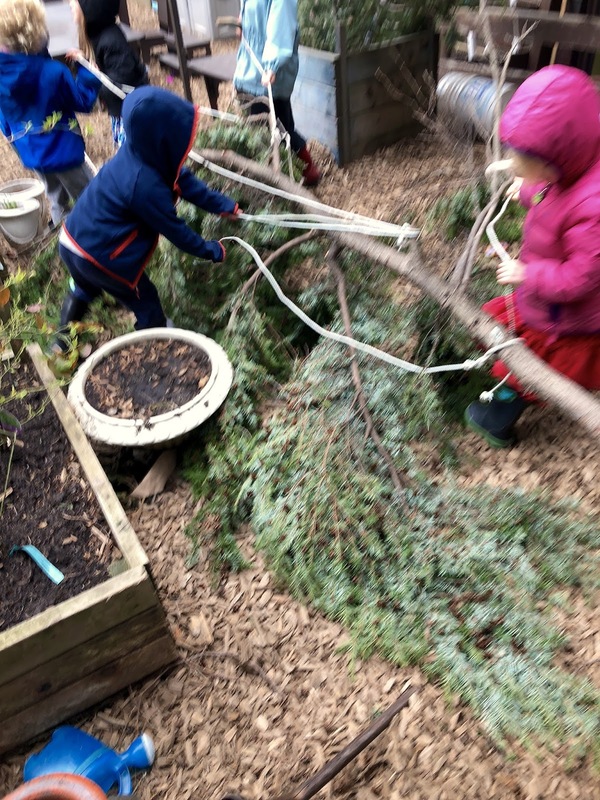 The dragging was slow, difficult work, their path impeded by a variety of obstacles, but at least they were going downhill. At some point it became clear to me that they weren't going to wind up in the sandpit and, unnecessarily and intrusively, I mentioned it. 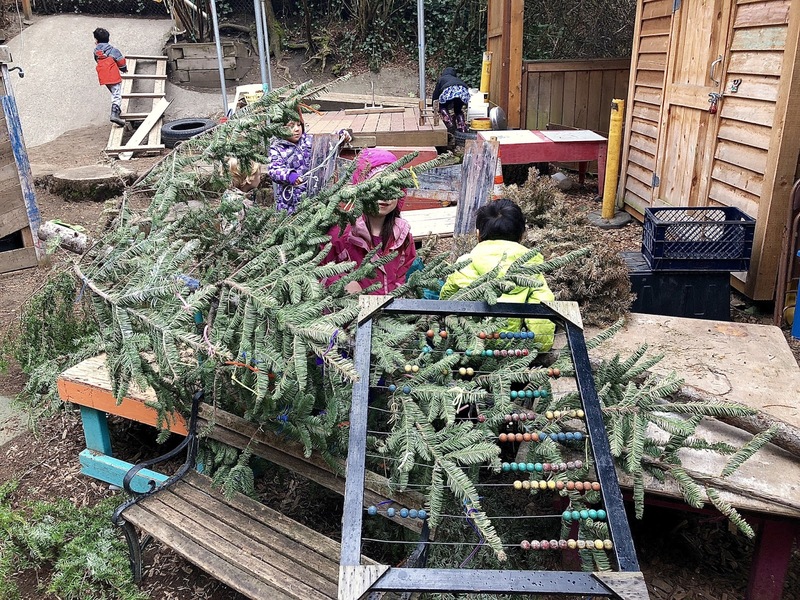 Thankfully, they ignored me as they managed to squeeze the branch through the narrow gap between the garden planting beds and the tables and chairs in our outdoor art area. They got stuck on the unicycle merry-go-round and got unstuck with a little bit of help from me. By the time they arrived at the workbench, they were done, all of them. Someone said, "Let's leave it here," which was agreed upon by the wordless consensus of everyone dropping their ropes. 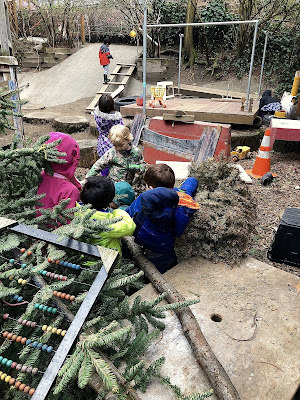 There are still a couple of old Christmas trees around the place and those were soon added to what was being alternatively referred to as a "fort," a "nest," and "our house." As the children played in, around and under the pile of trunks and branches, I was taken back to my own childhood when we would play among the refuse of our neighbors' major pruning jobs. They would pile the limbs along the curbside where they often sat for weeks waiting for the city to haul them away and we, the neighborhood children, would play there in our fort or nest or house. I recall sometimes imagining that this must be what it was like to be a squirrel or a robin, living amongst the branches, a world into which I'd been magically transported. 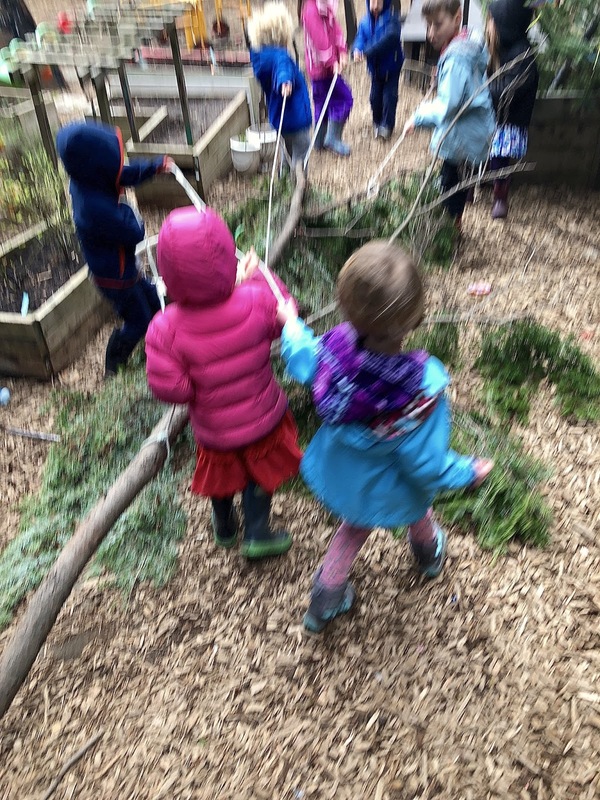 I don't know if we'll be able to keep our new branch in that spot for more than a day or two, but I have no doubt that it will be with us for some time, becoming part of our story, a versatile, new playground toy that fell from the sky.